Over 700 employees at the Environmental Protection Agency have quit or taken early retirement during the Trump administration so far, bringing the agency close to employment levels not seen since Reagan. ThinkProgress, whose senior editor is scared of his plumber who he fears may have voted for Trump, is warning that the exodus will lead to "dirtier air" and "dirtier water." "Since Environmental Protection Agency Administrator Scott Pruitt took over the top job at the agency in March, more than 700 employees have either retired, taken voluntary buyouts, or quit, signaling the second-highest exodus of employees from the agency in nearly a decade," the liberal blog reported. "According to agency documents and federal employment statistics, 770 EPA employees departed the agency between April and December, leaving employment levels close to Reagan-era levels of staffing," ThinkProgress said. "According to the EPA's contingency shutdown plan for December, the agency currently has 14,449 employees on board—a marked change from the April contingency plan, which showed a staff of 15,219." After months of crying at their desks over Trump's election victory, bureaucrats are now "quitting in disgust." "There has been a drop of employees of 770 between April and December. While several hundred of those are buyouts, the rest of those are either people that are retiring or quitting in disgust," Kyla Bennett, who works for a nonprofit for government environment works, told ThinkProgress. "Is that number higher than it would normally be? I think it is." ThinkProgress quoted a former Obama EPA official who criticized the shrinking size of the EPA bureaucracy. 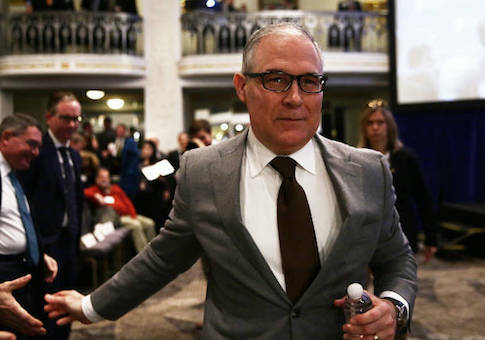 "Overall, large numbers of people leaving the EPA in this day and age is terrible," said Judith Enck. "Rolling back enforcement is very troubling—it essentially means that people are going to breathe dirtier air and drink dirtier water." Career bureaucrats taking voluntary buyouts is helping Pruitt and the Trump administration meet their goal of cutting the EPA workforce by 25 percent. "We're proud to report that we're reducing the size of government, protecting taxpayer dollars, and staying true to our core mission of protecting the environment and American jobs," Pruitt has said.